This video from Stephen Fry isn’t new, but I somehow missed seeing it, and I’m guessing many of you might have as well. It expresses everything I believe about how editors might best respond to grammar and usage “out in the world” when it departs from the norms we follow in formal contexts. I could never say it as well as Fry does, so I’ll let him guest-post here today. Watch it all the way through; it gets better and better. Away from my desk . . . This week and next I’m gadding about and not thinking about my blog. 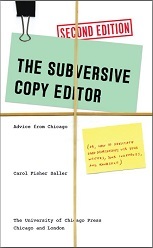 I will of course be thinking about copyediting—in between crab cakes—while I attend Ruth Thaler-Carter’s excellent Communication Central conference in Baltimore with a crowd of like-minded writers and editors. After that, I’ll be off to Daytona International Speedway, where I have a “4-Day Super Infield” ticket to camp at the track and watch my brother Tom race his vintage motorcycle. So You Think You Know Where You’re Going? Have you ever been put out of a cab after you waited forever and finally lassoed one and got in, and after sailing past a street where you would have turned (if you had been driving), you said, “Shouldn’t you have turned there?” and the driver slammed to the curb and said, “You can get another cab,” leaving you incredulously asking “What­—? Are you kidding? Are you putting me out?” and, seeing his face, had to grab your things and slam the door (cab drivers hate that) and hike back four blocks to the thoroughfare and wait for another cab? And isn’t that exactly the feeling you get when you suddenly run into trouble with a tricky word-processing feat that you’ve done before with no problem? “What­—?” you think, as you start the slog back to the beginning. In my case, it’s always my fault. I left out a step, didn’t prepare properly, hit the wrong key. Or as that cab driver might say, I thought I knew the fastest route and bullied my way to a dead end. This time it was the NoteStripper macro,* which miraculously unlinks all the endnotes or footnotes in a document, leaving the superscript callouts in the text and compiling the corresponding notes into a matching list. Even more miraculous: the program can do the reverse; that is, it can embed notes that have been hard-typed. —The number of notes must match the number of callouts. —Every note must start with a numeral: clear out any stray spaces or tabs. —All note callouts must be formatted as superscripts. —Nothing else in the document can be superscripted. I was using the easier macro, converting notes into text, but even then, my attempts to convert a large file (with 1,040 notes) failed on my first three tries. On an impulse, I read the instructions, which told me that sometimes a file can simply be corrupted at some point. I tried again and saw that the file converted successfully up to a point before it crashed. So I deleted the first note after the crash point. That did the trick: the file converted in seconds, after which I typed the corrupted note back in. On the night I lost that cab, the second one made up for it: a brand-new car, a quiet jazz CD, and a lovely driver who didn’t smoke or text. He took the same route as the other guy, but this time I kept my mouth shut—and was home in record time. **Not all products offer such helpful guidance. If you find yourself trying to make sense of gobbled directions, read my Troubleshooting Guide to Following Instructions.